SET OF 25. This lovely 5”x7” double sided print comes in a set of 25 cards. 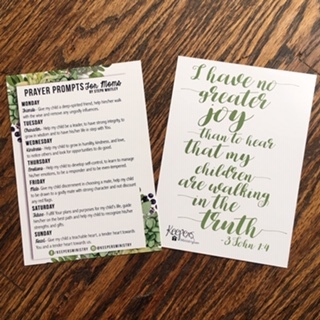 Printed on high quality glossy card stock, these cards are a wonderful guide to remind us daily to prayer over our children. On the front are the prompts for each day of the week, written by Steph Whitley. 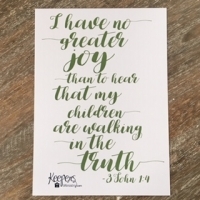 The back features 3 John 1:4, reminding us of the great joy we have in watching them follow God and walk in His truth. Use these for stocking stuffers, add them to gift baskets, stick one in your Bible, hang it on your fridge or mirror. Wherever you put them, we pray they will be a useful tool to encourage specific prayer opportunities. This set is perfect for the study leader looking for a meaningful gift!